Jack Levine (1915- 2010) imparted a wry and penetrating social commentary to his work that deftly skewered the rich and powerful, as well as all those whom he encountered who were inflated by pretension or hypocrisy. He developed a highly individualized modernist approach, an expressive mode of painting that he often used to critique injustice and dishonesty in American society. He also explored classical and biblical themes with an updated sensibility that demonstrated his lifetime study of art history and mastery of Western painting traditions. Throughout his long career, he remained committed to figurative art, disregarding trends in the art world that did not suit his purposes. This was particularly true in the 1950s, when abstraction was in ascendance and social content was deemed out of fashion by leading writers and critics. The youngest of eight children born to Lithuanian immigrant parents, Levine grew up in Boston’s South End. In 1929, at the age of fourteen, he began studying painting with Denman Ross in the Art Department at Harvard University. From 1935 to 1940, he was employed intermittently by the Works Progress Administration. His WPA paintings, Card Game (1933) and Brain Trust (1935), were exhibited at the Museum of Modern Art in New York in 1936. The following year, he achieved national recognition with The Feast of Pure Reason (1937), which entered the collection of the Museum of Modern Art. In 1939, at age twenty-four, he joined Edith Halpert’s prestigious Downtown Gallery. Levine’s meteoric rise was interrupted by a three and a half year stint in the Army during World War II. After the war, he married artist Ruth Gikow and moved to New York City. In 1952, Boston’s Institute of Contemporary Art organized a major retrospective of his work that traveled widely for three years, closing at the Whitney Museum of American Art. 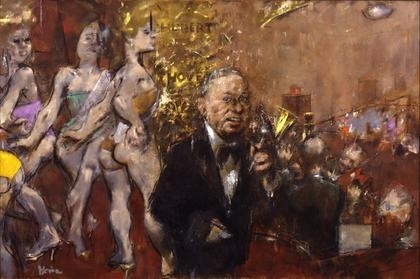 During the 1950s and 1960s, Levine continued to create some of his finest work, including what is often regarded as his magnum opus, Gangster Funeral (1952-53), which was acquired by the Whitney Museum. Between 1960 and 1975, Levine embraced topics ranging from the American Civil Rights movement and prison conditions in Spain under Francisco Franco to a series on the theme of the Judgment of Paris. 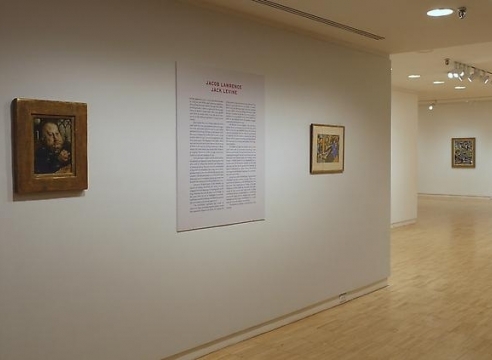 In 1978, a comprehensive retrospective of his work organized by the Jewish Museum traveled throughout the country, and in 1999, the Brooklyn Museum presented an exhibition of his etchings and lithographs. An award-winning documentary film titled Jack Levine: A Feast of Pure Reason was produced and directed by David Sutherland in 1985, while filmmaker William Powers released Jack Levine: An Autobiography on Film in 2005.